"Rydaz Redemption" is your full rap album for sure and for every drawback within, there are equal moments of clever, thoughtful facets that make it very likeable. All in all, the album has a diggable 13-tracks of heavy beats and clever lyrical content. SKOPE REVIEWS MR. ENVI'S ALBUM "RYDAZ REDEMPTION"
It is no mistake that the second track on the new release from Mr. Envi is titled "I'm Ma Boss" in that he actually is the CEO of Louisiana's Southern Stisles Records label. But it was perhaps that role that placed his personal creative endeavors on the back burner while Envi poured his efforts and time into others. "One of my biggest setbacks was not pushing myself as an artist first," he said in an interview with WWS Magazine. "I invested a lot of time, money and patience in other artists trying to establish my brand. How I bounced back was putting that same time and effort into me." At first, that effort ushered up the five-track teaser EP of the same name. Now the full-length of Rydaz is available and boasts 13-tracks of heavy beats and clever lyrical content. Album standout, the aforementioned "I'm Ma Boss" is a synth-heavy intro track that sounds reminiscent of the rap delivery of 50 Cent. The lyrical matter is boastful, but clever and serves as that self-promotion track that has become ubiquitous among virtually all Hip-Hop albums. "Boss" is appropriately placed in that is certainly sets a precedence for the album contents. "Cold Outside" is a cautionary tale track again, all too ubiquitous for Hip-Hop albums with "gangsta" lyrical matter of rolling blunts and toting chrome, but the track shines in that it isn't bogged down by heavy effects; allowing Envi's rap delivery to stand at the foreground of the track. The autotuned "I Just Wanna" is a down-tempo rap track version of a love song, I suppose. The vocal effects seem misplaced and frankly are distracting. Not that autotune can't have its place, but this instance seems like the decision to use it was made and its placement was the afterthought to the detriment of the track as a whole. "Do Tha Thang" is the opposite in terms of effects with an opening vocal sample that sends the listener in one direction only to give to piano notes while the track slowly builds to crescendo. With a myriad of time changes throughout the verses and chorus and the constant of backing piano makes this arguably the catchiest track on the album. "Boss" is your full rap album for sure and for every drawback within, there are equal moments of clever, thoughtful facets that make it very likeable. Envi has a good rap delivery but throughout I get a bit lost and find myself wanting him to return to the mic and eschew the myriad of guest appearances on the album. All in all, the album has a very diggable amateurness to it but is not beyond a bit of old fashioned spit shine and polish. - Alabama native Holland Dai’mon Witherspoon went through the ringer a few times. The rapper, who records under the name Mr. Envi’, began recording on his own in 2003 but suffered a few false starts. Now older and wiser, Mr. Envi’ is back at it – this time with momentum on his side. 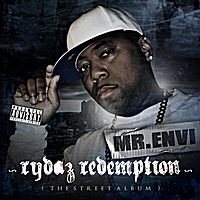 Rydaz Redemption the EP is one of eight projects released in the past three years. With five smooth tracks clocking in at under 20 minutes, it’s a solid introduction from a true rap grinder. Rydaz Redemption the EP, released on the Southern Stisles label (of which Witherspoon is the CEO), kicks off with “I’mma Boss,” a deep bass and synth-heavy track that announces the persona of Mr. Envi’: He’s a boss. The track is a standard hype track in many ways – a confident signifier song to serve as both a statement and a challenge to listeners and competitors. Rather than seeming confrontational, though, Mr. Envi’ seems comfortable and relaxed. Obvious Rick Ross references abound, and Envi’ evokes that Florida rapper both in delivery and in vocabulary. The topic isn’t exactly profound or earth shattering, but it’s a well-delivered status track that sets the mood for the Rydaz Redemption the EP off the bat. “Spotlight,” the EP’s second track, has a beat that resembles a chopped and reorganized version of Warren G’s “Regulators.” Though the beat seems strangely familiar, however, the track doesn’t seem derivative. It pulses forward, telling the story of a woman dealing with the pitfalls of celebrity. It’s an interesting contrast of light beat and heavy subject material, but Mr. Envi’ balances those factors well and spins them into an enjoyable track. Some of the rhymes on “Spotlight” seem forced, but in general, it’s a solid tune to follow “I’mma Boss,” giving a different perspective from that initial track. The EP’s third track again taps into the Miami hip hop feel, with synthesized strings creating the background for a track that exalts the grind and the bills that come with it. It’s closer to the EP’s opening track – a boasting blast that invites all comers. “I make music for hustlers/I make music for thugs/I make music for the older crowd that likes to cut a rug,” raps Envi’, and he’s dead on – these songs have broad appeal. On the fourth and fifth tracks of Rydaz Redemption the EP, Mr. Envi’ recruits some help in the form of guest spots from Truehillz, S.G., and Bigg Redd. The EP’s first real misstep comes in the form of heavy-handed application of autotune on the intro of “I Just Wanna.” Rather than making minor tweaks via vocoder, the track employs a clunkier retuning, eliminating the smoothness that this track calls for and leaving it only a shade of what it could potentially be. The verses from Mr. Envi’ are solid and the song has the potential to be a late night slow burner, but it’s not easy to get through the first forty-five seconds. “Do It Big” closes the album on a weaker note as well, featuring a fast beat and a couple guest verses that sound a bit hectic. Rydaz Redemption the EP is a solid collection that starts out on a strong foot and unfortunately falters as it runs its course. That said, it is an enjoyable listen, and well worth the time it takes to spin its five brief tracks. Mr. Envi’ is at his best when he raps on his own; his voice and vocals are good enough to carry tracks on their own without guest spots. The EP seems to be meant as a teaser for an upcoming album, in which case it absolutely does its purpose. There are questions left unanswered and gaps to be addressed, but Rydas Redemption the EP will whet the appetite of hip hop fans and leave them hoping for more.